If you are an individual who needs a website for personal reasons, a small business owner, larger business owner, or WordPress developer, you will eventually find yourself evaluating WordPress themes for the website or website(s) you want to be built. Not all WordPress websites are created equal, and you will find that these companies have different features and services available that vary widely in what they offer. In order to find something that really does the trick for you and your needs, you should take some time and look at the top places to find premium WordPress themes. Often, you will also find a host of other available features for your website in the process. It can be somewhat confusing at times for some people, but there are advantages for specific needs offered by most WordPress theme websites. In order to help you determine which theme provider would best suit you, we developed a list of the top 4 places to find Premium WordPress Themes. Unlimited Use. Elegant offers unlimited use, so you can forget about paying for each specific theme, allowing you the flexibility to pick and choose and change website designs at your leisure. This is a great package for WordPress developers as well as those who would like to change their website’s look periodically. One Price for Everything. Elegant Themes offers access to their complete collection of themes and plug-ins for one special low price, for life. This is a bargain for those designers who want to make the most of their budget and offer beautiful designs at an affordable price to their clients. The “Ultimate ToolKit.” With 87 designs and 3 excellent plug-ins, you will find that an amazing degree of variety and functionality is at your disposal with Elegant Themes. Intended to serve all potentially all purposes you may have for a WordPress site, Elegant Themes provides a full-service shop to assist with any website build need. Thrive WordPress Themes hosts an excellent array of features that are ideal for many small business owners. Besides offering strictly themes and plug-ins, they also showcase awesome tools that aid business owners in marketing and monitoring their business presence online. Thrive Themes. The WordPress themes provided by Thrive are excellent, attractive, and suitable for any business website. These themes are fully customizable with all other Thrive features. Thrive Leads. The drag-and-drop builder creates any type of lead generation form and builds it into the design of your website, and you can change them up any time you like. A/B testing options and different forms for different visitors are available. There are many templates available to choose from also. Thrive Quiz Builder. Create quizzes and interact with your customers, gather information, and draw the customer closer to your business with these important and useful tools. They provide easy-to-digest reports, increase traffic, and help build laser-targeted opt-in email lists based on quiz results. Thrive Ultimatum. Get customers to sign up for your special promotions by offering limited edition or time-sensitive deals on a wide variety of items such as coupons, courses, and much more. Make people take your offer through a fear of missing out on the opportunity. Thrive Ovation. This set-and-forget testimonial system publishes outstanding reviews from your real customers all over your site and refreshes them periodically. Clever Widgets. The widget collection optimizes customer interaction and engagement. Headline Optimizer. This feature uses testing, not guesswork, on content headline creation. Replaces your blog and other content headlines with winning ones. Thrive Apprentice. Create awesome-looking courses as lead magnets or paid courses that seamlessly integrate with the rest of your website, right from your dashboard. Thrive Comments. Use social media and commentary to your advantage and harness the power of the comment with features like up and down voting and after-comment features. These features are just some of what Thrive WordPress Themes has to offer in the way of optimal features that benefit you and your business, and if you visit their website, you can learn all there is to know. Premium WordPress themes from MyThemeShop have powered over 400,000 customers so far and counting. The motto at MyThemeShop is “The perfect solution for ANY online presence.” There is a huge assortment of available themes and many different key features that make this theme provider an ideal choice for almost any individual or business who needs an attractive, functional website. WP Review Pro. Manages reviews on your website. WP Quiz Pro. Creates different quizzes and manages their use of your website. WP Subscribe Pro. Manages the email subscription list for your website. WP Notification Bar Pro. Handles the notification functions built into your website. WP Mega Menu. This will optimize the functionality of your navigation system. WP Tab Widget Pro. This plug-in adds widget functionality to your tabs. MyThemeShop Premium WordPress themes are built with responsive characteristics, which means they will perform as effectively on mobile devices as well as PCs. Responsive websites are crucial to the success of any website in the current marketplace, as people often use their smartphones to conduct business on the internet or gather information. Other devices such as tablets are also optimized for use with a responsive theme design. Excellent User Experience. MyThemeShop has done all the legwork to free you up to do what you need to do the most, and that is published killer content. Knowledgeable, Devoted Support. The customer service at MyThemeSHop never treats you poorly. You are a valued customer, and they treat you like one. Super-Fast Load Times. A quick loading website is indispensable in today’s lightning-quick world. The themes at MyThemeShop are designed for rapid loading, and this prevents customers from bouncing from your site. MyThemeShop is one of the better theme shops online and offers many more features than those listed here. For a comprehensive evaluation of their service and products, visit their website. StudioPress is one of the best WordPress theme companies you can find online. They offer a high-end WordPress theme experience to those who need a superior website in terms of style and performance. The robust features of StudioPress premium website themes are based on the Genesis framework, which theme users must have to get started. This advanced framework allows you to execute a professional design from the ground up, especially useful to industry developers and designers who need a hands-on, expert design platform. WordPress Hosting. They host websites at affordable rates. Premium Themes. They offer a huge assortment of stunning, industry-leading WordPress themes that are fully functional and highly robust. The Genesis Framework. 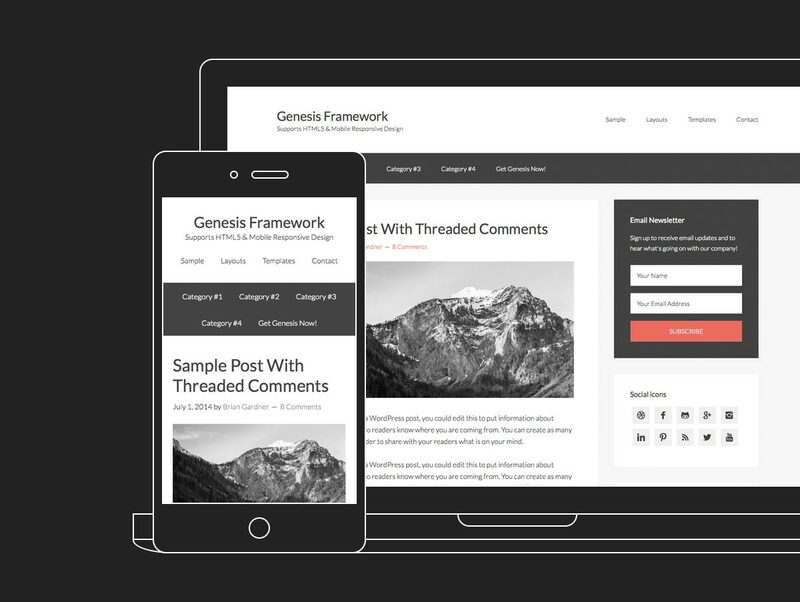 Use of the Genesis framework allows for sophisticated and beautiful website design, creation, and management. Pricing for the StudioPress plans are surprisingly affordable and within reach of just about anyone with professional skills. This site is not for novices or those without experience and knowledge in WordPress theme customization, design, or development. The prices for these plans range from just over $24 to $41 per month with no hidden fees. One thing to feel good about with StudioPress is if your traffic and customers exceed what is allowed in your plan, they won’t nickel and dime you to death. Instead, they will let you know what kind of potential increase in bandwidth you will need. There are never any surprises with fees or billing with StudioPress. If you are interested in StudioPress, you can find out more about their world-class products and services by visiting their website. These different premium WordPress theme providers all operate slightly differently from each other and offer different features, plans, pricing, and services. Each of these WordPress theme providers offers great products and services, some of them ideal for DIY designers, and all of them offer features that make them excellent choices for professional designers or developers. You will find something you need in at least one of these sites no matter who you are.